U.S. Secret Military Operation in Yemen: A Perfect War Crime! After the tragedy of 9/11, the question of the U.S. military response to win the “War on Terror” in the Middle East and beyond was publicly discussed and justified by the elite in Washington. After the occupation of Afghanistan in 2001; the warmongers in the Bush administration -based on the fake documents- argued that if we don’t take out Saddam now, we will face the “Mushroom Cloud” later. They were confident that fearful Americans will support their military aggression. On March 19, 2003, the U.S. launched its “Shock and Awe” bombing campaign and killed innocent Iraqi civilians, occupied that country but was not able to show any trace of WMD or an active nuclear program in Iraq. Prior to the Iraq war, millions in the U.S. and around the world courageously took to the street and opposed the invasion of Iraq; but at the same time, the majority of American people silently stayed home and hoped the “terrorists” would be defeated soon by the U.S. military might. The invasion of Iraq simply failed. The war on terror created chaos and Iraq became the cradle of new terrorist groups. The U.S. invasion of Iraq did not “FREE” Iraqis, but it opened the eyes of millions in the U.S. and around the world to the barbaric nature of the U.S. military and its ruthless generals on the field and the hypocrite politicians/warmongers in the White House and Congress. The glory of “Operation Enduring Freedom” was tarred with the horrifying and torturous pictures of the abusive American soldiers and their Iraqi victims in the Abu Ghraib prison in Baghdad. Meanwhile in the U.S., in the absence of a massive antiwar movement, an antiwar sentiment started to grow. Public opinion turned against all wars as it did during the Vietnam War. The antiwar sentiment among the working people who were concerned about their own problems; job security, healthcare and decent schools for their children forced the U.S. to adopt new ways of military intervention. A “don’t tell” strategy which is hidden from the public was adopted and practiced by Pentagon. The ongoing drone strikes against “enemies” in Northern Pakistan or Somalia by the order of President Drone Obama became normal and daily operations. In March 2011, Mrs. Clinton as the Secretary of State told NATO allies that the U.S. mission in Libya is “to enforce the no-fly zone and protect civilians”. She convinced the Obama administration to bomb Libya back to the dark ages from the air without the need of having American boots on the ground except for a few CIA operatives and military advisors. In Syria, the administration unable to conduct a direct military intervention for regime change supported all kinds of shady anti-Assad “rebel” groups with close ties to the remnants of Al-Qaeda terrorist groups. Today in Yemen, General Mad Dog Mattis’ dream in conducting a perfect War Crime has come true. This new condition gives the warmongers in the military and General Mattis the opportunity to set the stage confronting Iran militarily without authorization from Congress. Apparently, the U.N. report of the death of 10,000 people in Yemen since 2015 is not enough for the generals and Pentagon. They are not concerned about Mark Lowcock -the head of the UN office for the coordination of Humanitarian Affairs (OCHA)- warning that people in war-torn Yemen are facing a situation that “looks like the Apocalypse”. The escalation of war secretly in Yemen makes the prospect of a catastrophic regional war more real and imminent. With the recent victory toward a peaceful Korean peninsula; gaining political ground by Hezbollah in national elections in Lebanon and the defeat of anti-Assad groups backed by the U.S. in Syria leaves Yemen the last battleground for war against Iran. Therefore Yemen should be the main focus of peace activists around the world not only to respond to the dire humanitarian crisis but also to end the overt and covert military operations and relentless bombing of none military targets, residential areas, schools and hospitals by the powerful military forces in that country. As President Trump in justification to withdraw from JCPOA agreement (Iran Deal) gave an even more distorted history of Iran Nuclear program than Mr. Netanyahu disastrous presentation a few days ago, the world once again witnessed the isolated and weak U.S. administration. In short Mr. Trump’s announcement was a diplomatic fluff! It was an isolated act that would not deter E.U. of continuing economic relation with Iran. Talk of more sanctions would not make the U.S. stronger in the Middle East. The U.S. can only rely on its military might to confront Iran and an occupied Yemen is a preferable scenario. 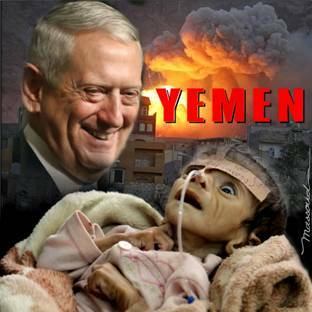 It is imperative for the democratic minded people and peace activists to expose the secret and unauthorized U.S. military operations in Yemen which could become the springboard for a global war. U.S. OUT OF YEMEN NOW!